Are you interested in making the switch from 9-5 and working on the same projects every day? Becoming a freelancer is exciting and a little terrifying. Lucky for you, we’re here to provide you with the tools and tips you need to become a successful freelancer. There are currently over 57 million freelancers in the US, and nearly 50% of millennial workers are already freelancing. As hard as that is to believe, those number are only going to increase. According to a recent study, if the growth of freelancers continues as expected, the majority of workers will be freelance by 2027. If you needed a reason to start working freelance, let this be it. If you’re still indecisive, the most in demand freelance talent is for Social Media Managers, UX Designers, Email Marketing Managers, Production Artists, Project Managers, Social Graphic Designers/Producers, and Content Creators. San Francisco - When freelancing in the Bay Area, networking is of the upmost importance. It is popular for its tech and startup companies, but the area is full of art, design, and opportunities for freelancers across varying industries. New York City - If you are both an early bird and a night owl, the city that never sleeps is for you. Fashion, art, tech, finance, you name it, New York has it, and that includes a major need for freelancers. Chicago - Chicago is the perfect city for your freelance career if you are interested in marketing, design, or advertising. Toronto - Did you know that more than half of the people who live in Toronto were born outside of Canada? If you are interested in business, finance, or film and television, there are plenty of freelance opportunities available for you in Toronto. Want to know the best part about these cities? 24 Seven has offices in each one! 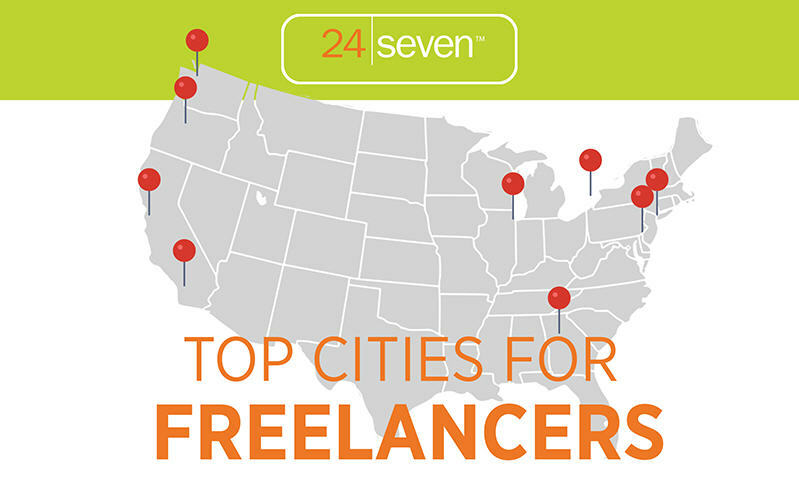 No matter what city you land in, we have freelance positions available! While you have been considering working freelance, we’re sure you have heard some conflicting myths that we want to clarify. Business comes to you. If only it were that easy. Part of the job of a freelancer is sourcing new clients and projects to work on. Once you begin freelancing more frequently, work will start coming in through referrals , and you can always work with an agency like 24 Seven, who will find gigs for you. No benefits. While this is definitely a deal-breaker for some, if you follow the last piece of advice from above, recruiting companies, like 24 Seven, provide their freelancers with health benefits. New laws have also made benefits more attainable without needing a full-time job. Clients pay in a timely manner. You see your invoice as a paycheck, your client sees it as an invoice. While being a freelancer has several perks, one of the responsibilities that comes with working directly with clients is the need to plan ahead financial for not having a weekly or biweekly paycheck. Of course, when you work with an agency, you are technically their employee and can count on regular paychecks. It’s a lonely lifestyle. This comes from the constant idea that freelancers only work from home. Today there are several free shared workspaces, coffee shops, and libraries available for your use. For more on these myths, and insights from our resident marketing consultant, click here. Once you have made the jump from 9-5 to making your own schedule, feelings of excitement and panic may arise. Yes, you now have the freedom you’ve been dreaming of, but there is also a lot of responsibility that comes with being a freelancer. It is now up to you to hold yourself accountable and manage your time efficiently. Focus on one task at a time & stay organized. We are all guilty of multitasking, and claiming we can do everything at once, but when it comes to work, especially sensitive projects, committing to one task at a time will allow you to cross more things off of your list instead of wasting time bouncing between projects. Treat freelance as a 9-5. Freelancing is not a smaller time commitment than a 9-5 job. If anything, it can at times be more, especially if there is a quick turnaround for a new project. Whether you need to schedule your to-dos in a planner, or time block your specific tasks, this will ensure you are on track with your projects, plus will allow you to communicate with others in the office if needed. Avoid distractions. Both social media and the internet are a black hole of procrastination. Whether it be videos or seeing what your friends are up to, avoid temptation and save the funny YouTube clip for a break. It is up to you to meet your deadlines! For more tips on managing your time as a freelancer, read the full blog post here! Technology has influenced the way we communicate on a daily basis, whether it be with coworkers, friends, or family, our options are abundant. Platforms such as Slack, Teams, and company focused IM platforms have changed the team communication game, allowing you to organize conversations, collaborate beyond your company, make video calls, and share files. These technologies make it easy and feasible to communicate across time changes, schedule conference calls and video conferences all at the click of a button.